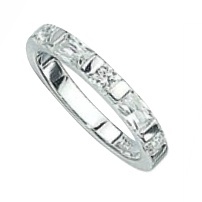 A delightful ring reflecting the contrasts between the sexes. The male represented by the smooth clean square of Sterling Silver, contrasted with the sparkling sparkling CZ right by its side. 925 Sterling Silver.